MUSEUM - WELCOME TO KID DOMINO! is open to the public every Saturday from 10 a.m. to 4 p.m. There is no admission charge, but donations for preserving the artwork are gratefully accepted. The museum opened its doors in late 2013. Since then, it has welcomed hundreds of visitors from several states throughout the Midwest. Many paintings on display here are part of Kid Domino’s “Forgotten City” graphic novel series. In fact, the first seven paintings on the south wall are the original artwork from which the covers for the first seven books were adapted. Several others represent “concept” drawings from which the final art was drawn, and still other renderings illustrate how a single page in a graphic novel is conceived, refined and finalized. 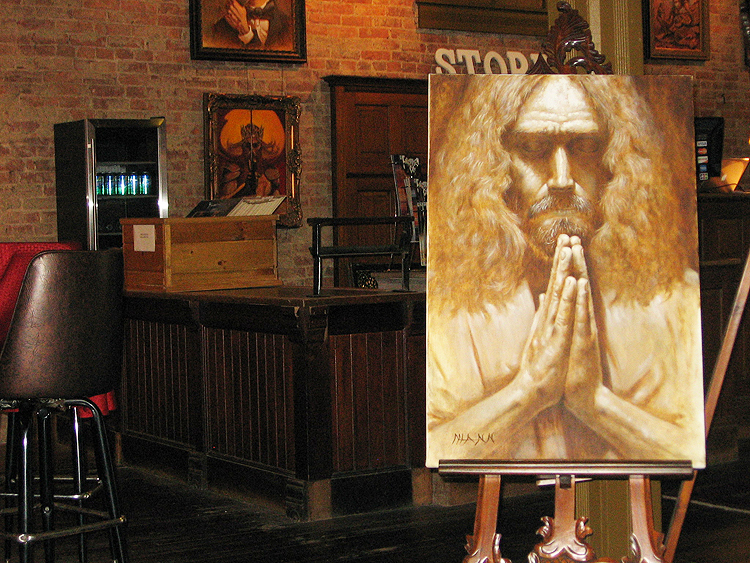 The museum is also home of original works by acclaimed artists, such as Frank Frazetta, who transformed the illustrative world with his mix of traditional fine art and fantasy; Joe Jusko, who is one of the most well respected painters in the industry today and has worked on cover work for company’s such as Marvel; Bob Camp, whose work led to breakthroughs in animation; and Richard Green, who is best known for his character creations from such work as Disney’s “Beauty and the Beast” and popular fantasy artist, Mike Hoffman. The building, which was constructed in 1860, has been home to numerous businesses over the years—a general store, a school, and even a gymnasium. 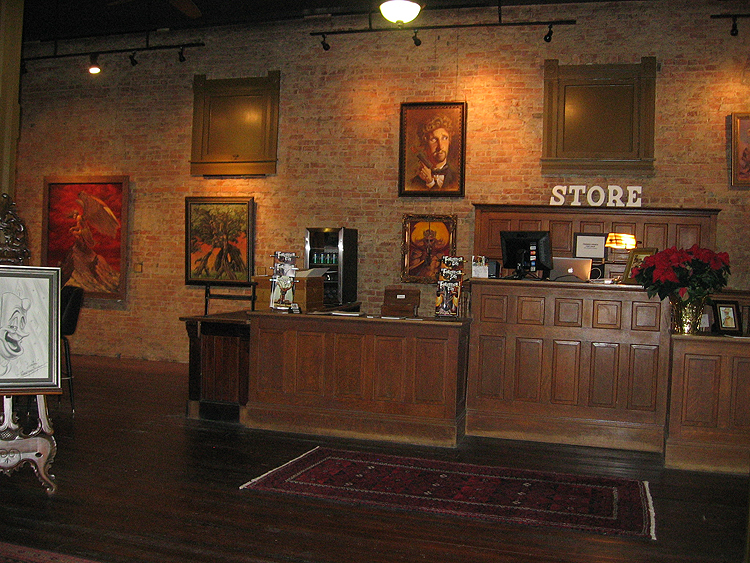 When the Mann brothers purchased the building in 2009, it had most recently served as an antique shop. By then, however, the building had begun showing its age and required almost a total restoration, which included a new roof, heating and air conditioning, walls, ceilings, and floors. The Manns were adamant about keeping as much of the original interior as possible, and today most of the floor, walls and ceiling in the museum are part of the beautiful fixtures initially built more than 120 years ago. While the original artwork displayed in the Kid Domino Museum is not for sale, prints of many of the pieces are available for purchase at the front desk. Thank you for stopping by. 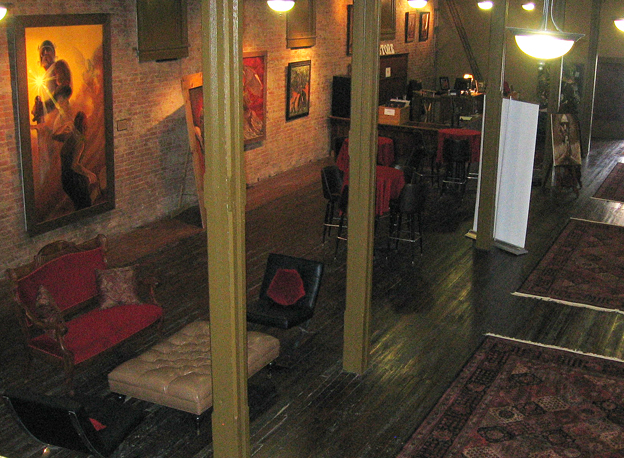 We invite you to have a look around, enjoy the artwork, have a beverage, and stay awhile. We also hope you will come back often. … And please be sure to tell your friends about us.